We are Canadian. We play rock 'n roll. 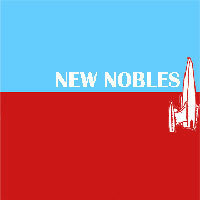 New Nobles are a female-fronted, three-piece, rock band founded by guitarist Dean Beardsley in 2005. The beauty of the New Nobles aesthetic is the dynamic relationship between the academically-trained and technically skilled Beardsley and the untrained passion of singer/bass player Jen Zentner. The result is a sound that is simultaneously raw and virile yet well-structured and melodic. Sonically uncluttered, fans describe them as having a classic rock sound with alternative/punk undertones. "What strikes me about New Nobles is they seem to have found the perfect mix between raw optimism and musical grit. They give you big hooks while sidestepping mainstream vanilla rock," producer Douglas Romanow observes. Dean Beardsley grew up listening to his older brother's records -- Pink Floyd, Status Quo, Rick Derringer to name a few. At the age of 14, and after hearing AC/DC for the first time on the Dr Demento show, he inherited a hand-me-down guitar and took to learning Angus Young solos. This would eventually lead to his high school band, Rezin, and later, his acceptance into the prestigious jazz program at Humber College. 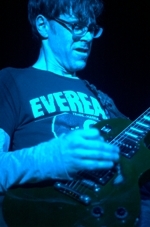 He paid serious dues playing in a top 40 cover band before forming New Nobles in 2005. Jen Zentner spent her teens and early 20's in Saskatoon, Saskatchewan in the heart of the punk rock scene of the mid-90's. She worked at one of many venues that swept the prairie landscape at that time and saw incredible acts up close and personal -- MDC, Lagwagon, The Smalls, DOA. She sites this as the most influential time of her life, musically. 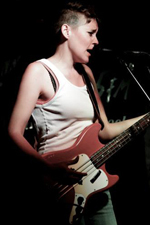 She joined New Nobles as bass player in 2005, started singing in 2010 during the recording of Come On. 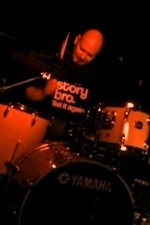 Robin Edwards can't remember a time when he didn't play drums. He grew up in a musical family -- his mother and grandfather were both musicians. Formal training started when he joined Cadets at the age of 12 and continued until, at the age of 17, he was a member of an award winning, international drum corps. He has since toured with a variety of acts and gigged with anyone and everyone. He joined New Nobles in 2010 for the recording of Come On and started playing live with the band in 2012.